With two wonderful, yet different sites to choose from, either for a holiday or as a base to explore further afield, we are very popular and pride ourselves on our level of service. No wonder then that we are very busy and that booking is essential, especially from mid May to mid September. Putsborough Sands is the perfect base from which to explore all that North Devon offers – from fantastic beaches, great surf, renowned gardens at Marwood, Rosemoor and Hartland, the National Trust at Arlington, Lundy Island, Great golf, or family entertainment at Watermouth Castle, The Big Sheep, Exmoor Zoo Wildlife & Dinosaur Park……..the list is endless! !……..So, whether you wish to explore, surf, walk or simply chill out, we have it all and we look forward to hearing from you. N.B. Our Manor Farm Site enjoys a discounted rate on the basic weekly charge throughout the year (see tariffs and vacancies) and will be open during October – for further details please contact us. 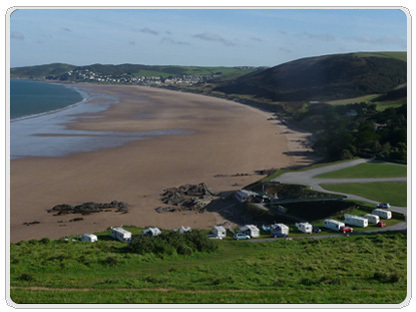 You can stay overnight in your campervan at Putsborough Sands in the adjacent car park area in “The High Vehicle Park”. 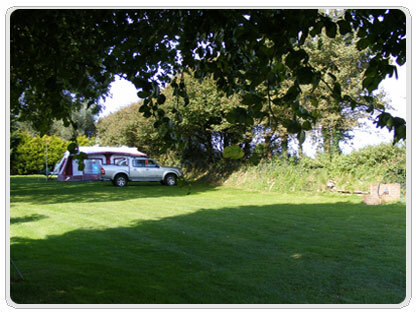 Charges vary between £25 and £45 per night depending on the time of year and how busy it is. There is no need to book, just turn up. Unfortunately, there is no electric hook- up and there are no hot showers. We wish we could improve on this arrangement, but we just don’t have the space or facilities.